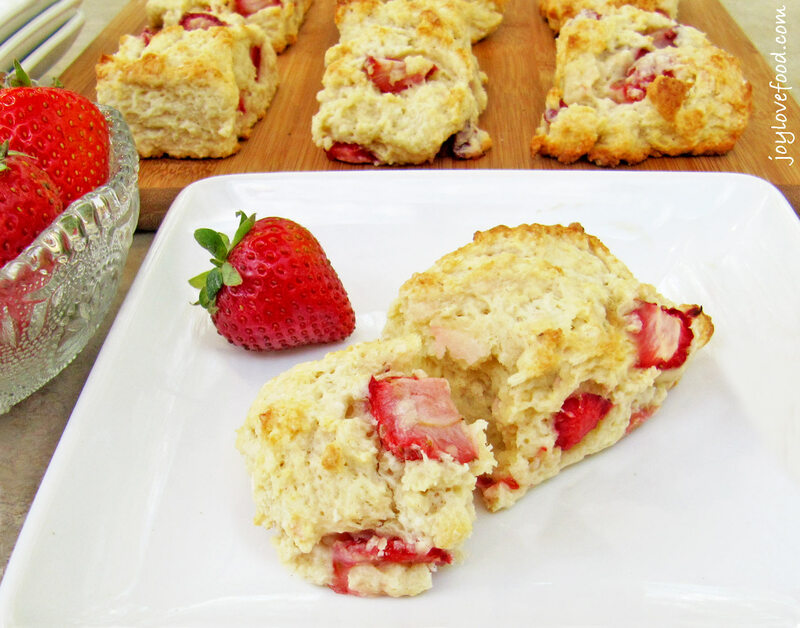 Fresh strawberries and cream are a delicious combination in these, tender, light and flaky Strawberry Shortcake Scones. I absolutely love scones, they are one of my favorite things to bake. And, I love trying new combinations of ingredients for making scones. A couple of weeks ago I shared these delicious Roasted Grape and Thyme Scones. Today I’m sharing another scone recipe, perfect for spring and summer, these wonderful Strawberry Shortcake Scones. Strawberry season doesn’t start here in Massachusetts until June, but we are now starting to get some wonderful sweet strawberries from California in the supermarkets. My almost 3-year old girls love strawberries and we’ve been going through several 2 pound containers of strawberries each week. Luckily, I was able to set aside enough strawberries to make these scones, before my girls devoured them all. 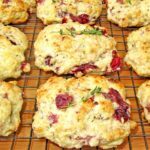 I came across this recipe for Strawberry Shortcake Scones in last’s month’s issue of Better Homes and Garden (the original recipe for my Roasted Grape and Thyme Scones is also from that issue), and couldn’t wait to make them. I love strawberry shortcake. It’s such a classic summertime dessert and invokes so many wonderful childhood memories of family barbeques. I thought it would be a delicious in scone format, and it most certainly is. 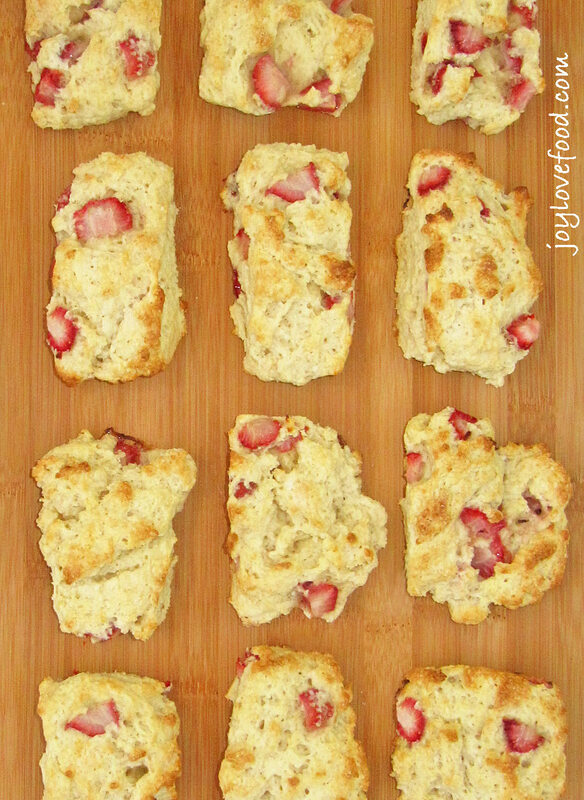 These Strawberry Shortcake Scones turned out beautifully. The fresh strawberries along with the cream in these tender flaky scones, is definitely reminiscent of strawberry shortcake. The recipe also calls for ricotta in the batter which make the scones extra tender. On the subject of fresh berries, I have a cute story to share. Cereal is a favorite breakfast item in our house. When we go food shopping, I often let the kids pick out which cereals they would like (as long as they are low in sugar and don’t contain artificial colors). Last week, one of my girls picked out a new cereal, and when we got home she couldn’t wait to try it. However, when I poured the cereal into her bowl, she became very upset and started crying. It turns out that there were fresh berries pictured on the box along with cereal. So, she was expecting fresh berries to be in the box along with the cereal. A reasonable expectation for an almost 3 year old, I think. Luckily, I had some fresh strawberries, which I quickly added to her bowl and happiness was restored. And, now she’s learned that just because something is pictured on the box, doesn’t mean that it will be in the box! 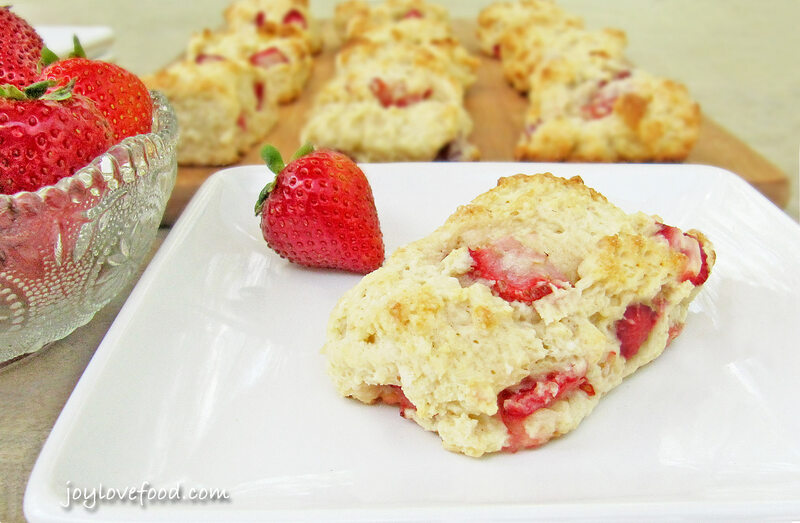 These Strawberry Shortcake Scones are delicious for breakfast with a cup of coffee. 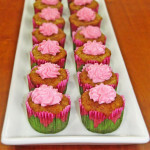 They are also wonderful as an afternoon snack along with a tall glass of iced tea or lemonade. These pretty scones would also be a wonderful addition to a special brunch for a bridal shower, Memorial’s Day or any day. 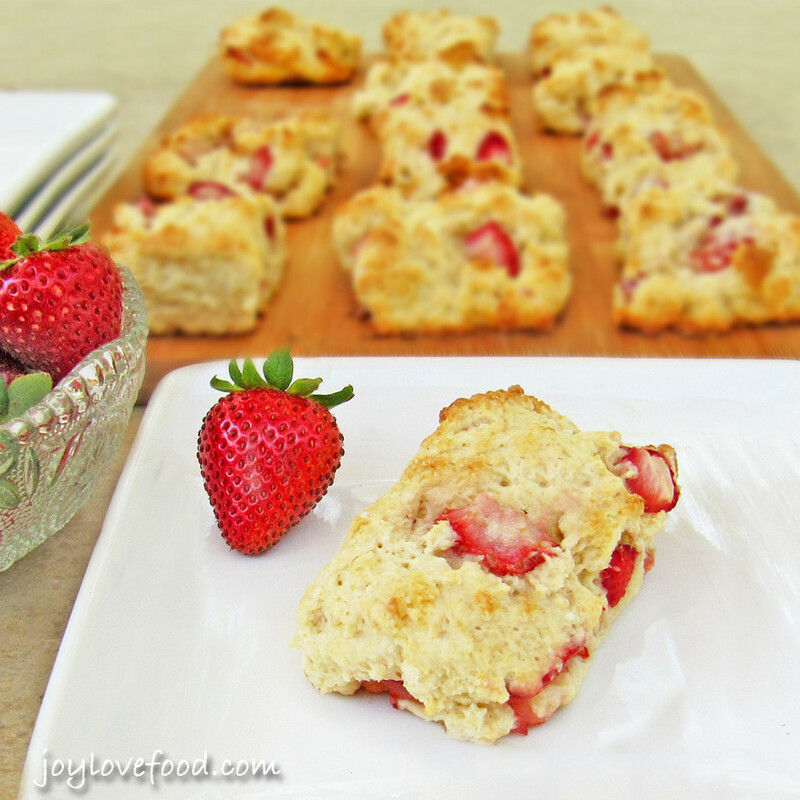 Strawberry Shortcake Scones -- the classic combination of strawberries and cream is delicious, in these tender, light and flaky scones. In a small bowl, toss strawberries with 1 tablespoon flour. In a large bowl, using a whisk, sift together 2 ½ cups flour, sugar, baking powder and salt. In a medium bowl, crack egg (discard shell), and lightly beat egg with a whisk. Whisk in ricotta cheese and whipping cream to blend. Add egg mixture, all at once, to well in the dry ingredients; Add in strawberries and stir with a spoon until just combined. Pat dough into an approximately 10 inch by 6 inch rectangle. Using a knife, cut into 12 approximately 2 ½ inch by 1 ½ inch rectangles. Brush scones with additional whipping cream and sprinkle with additional sugar. 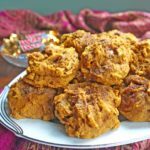 This entry was posted in Breads, Muffins & Scones, Breakfast & Brunch, Desserts & Sweet Treats and tagged breakfast, brunch, recipe, scones, shortcake, spring, strawberry, summer. I love scones – and strawberries and have saved your recipe. I’ve just discovered your blog and love it. These look delicious! Check out my Tuesday Treasures from the Thursday Favorite Things Blog where you are featured. Thanks for sharing your scones with the Say G’day Party Joy! Pinned Look forward to seeing you next week as always look forward to what you bring! Just yum…with coffee! Thanks for sharing with the Thursday Blog Hop! Those scones look divine! I may have to “borrow” this recipe for my garden tea party coming up! Thanks for sharing!!! I don’t cook a lot, but I am ADDICTED to scones. These looks so pretty and strawberry season is just around the corner. Stopping by from Thursday Favorite Things Blog Hop. These look seriously delicious, Joy! Love scones, love strawberries, can’t wait to make these! Pinned! Thank you for sharing at OMHGWW! Have a lovely week! These look amazing!! Thanks for Sharing on My 2 Favorite Things on Thursday – Link Party!! Hope to see you again tomorrow!! Pinned!! I’ll have to hide some strawberries from my little munch mounts so I can make these!! Yum! I bet the strawberries help keep the scones moist. Looks delicious. Erlene recently posted…Merry Monday Link Party #55 – Host number #9! These scones look and sound FANTASTIC !! Oooohhhh! I love a good scone, and this looks absolutely divine! Kim @The Baking ChocolaTess recently posted…20 Gooey S’Mores Desserts to Give You Something to S’mile About! These look absolutely delicious Joy! Pinned and shared and hope to see you on Saturday! Talk about a delicious summer breakfast- thanks for sharing! These scones look delicious. My strawberries are blooming in my garden so I can’t wait to give this a try. About the cereal box -I think they should be required to put in the box what’s on the outside. Strawberry scones are perfect for this time of year. I’m with your daughter. !f they put strawberries on the cereal box they should be IN the box! Good save mom, with those fresh berries. I’m glad you had them! I’ll take one of these gorgeous scones for breakfast! I’m with your daughter…I think if berries are on the box, they should be in the box, too! These look wonderful. They would be perfect with a cup of coffee in the morning. Nicky recently posted…How Far Would You Drive? Survey Says….. Thanks Nicky, they are indeed wonderful with coffee! Looks and sounds delicious! Thanks for sharing. Holy moly – I would never have thought to make strawberry shortcake into scones – two of my fav desserts combined! These look great! Thanks Lizzy, they’re two of my favorites too! Thanks Josie, these are indeed great for breakfast! Joy, these are marvelous. I just need a cup of coffee and I’d be all set. Those look lovely, Joy! I have been wanting to try making scones for the longest time! I need to just get into the kitchen and make these! Thanks Michelle, I hope you give these a try and enjoy! My husband wants to eat low carb, but your recipes for scones are making it hard for him to do. I just have to try the recipes and then he just has to eat it since I made it. Too funny Faye, I hope you do give these a try and you both enjoy! I was seriously craving scones just the other day. These look AMAZING! Can’t wait to try them! Thanks Chrisy, I hope you give these a try and enjoy! Oh my strawberry goodness, Im drooling, these look so good. I really think you should share these on WW and Friday Features this week. Keep baking up all your sweet goodies!! Thanks Karren, I’ve shared at both parties! 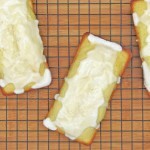 These look delicious, I love the addition of ricotta cheese! I love making fruit scones and have developed a tip that works out well- I slightly freeze the fruit after I’ve sliced them, that way they don’t get mushy or squished during the process. Thanks for coming by Emily and for the tip about freezing the cut fruit, I will have to give that a try! I think I need a breakfast redo! I wish these had been on my table this morning. YUM! Thanks Mirlandra! These scones are indeed wonderful for breakfast! These look amazing! I’m going to have to save this recipe and make them when my mom is here in a couple of weeks. Our strawberry season is almost played out -which is odd to say, but true. In Mississippi, we don’t grow a lot of our own strawberries – much more blueberries here – but we get a ton from Louisiana. Hi Jen, I hope you give this a try and you and your mom enjoy! I’m still thinking about your last scone recipe! This one just looks like spring! Beautiful. Can’t wait to try it out. Thanks Christine! 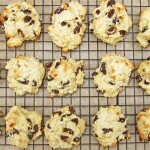 I hope you give this scone recipe a try and enjoy! 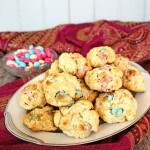 These scones look amazing and I love the cereal story–precious girl! I love the colors and I can already imagine the taste! Thanks Merlinda! Thanks for visiting, I always enjoy joining your link party and seeing your beautiful photos! Hi there! Visiting from Oh My Heartsie GIrl. This looks so good! I love scones and I love strawberries, so I bet they’re delicious together! Thanks for sharing the recipe! These look delicious! The words strawberry and shortcake get me every time. We are just starting to get ripe berries in our patch, but we don’t get enough to cook with. One or two for me, one or two for my husband and the rest end up in the belly of my two year old. But these would be worth a trip to the store to buy some! Thanks Carlee! I love anything strawberry shortcake too, how nice that you have your own strawberry patch! Thanks AnnMarie! Oooh, a scone pan? I may have to get one!